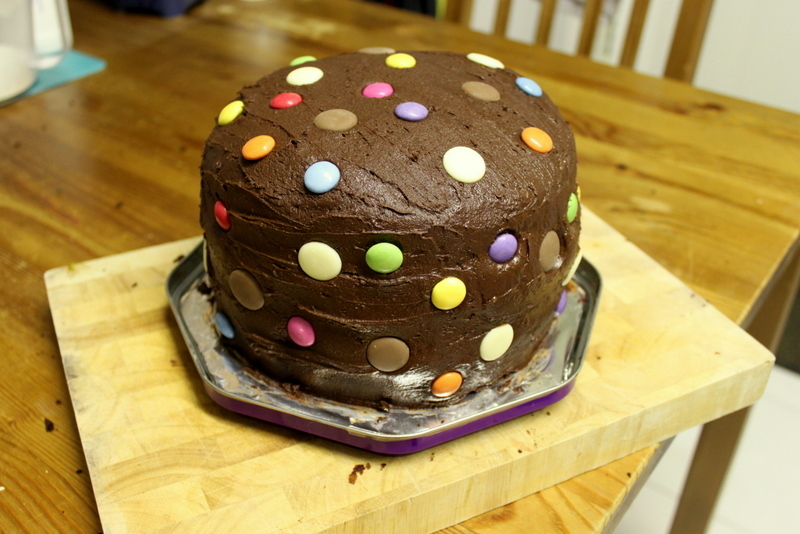 I spent a part of this afternoon and evening making a cake for a Children in Need bake sale tomorrow at Ian’s work. If you aren’t from the UK, Children in Need is the BBC’s charity that helps disadvantaged children and young people across the country. Once a year in November there is an appeal show to raise money for the charity, with celebrities singing, dancing, and doing all sorts of things. In the build up to the live appeal show there are loads of activities and events that happen all over the place… including things like this bake sale! You can read more about Children in Need here, if you have a few minutes spare. 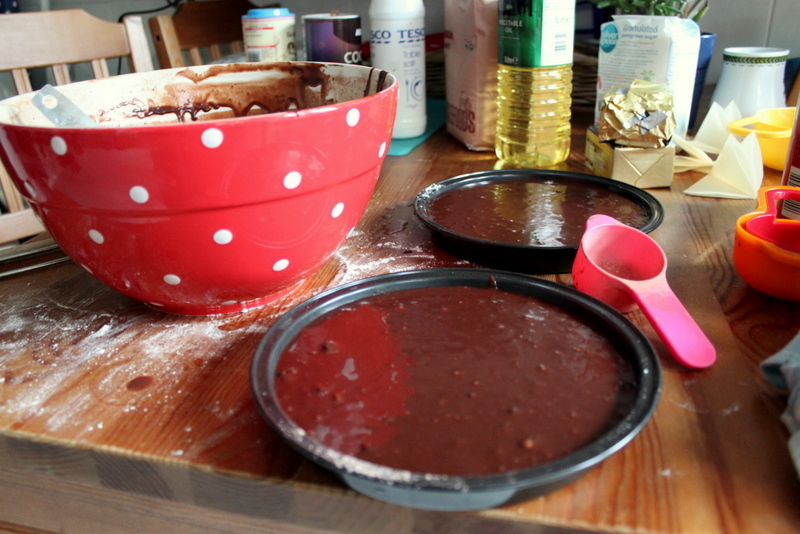 And now, the picturepalooza of my cake-making process and all of its beautiful disorganisation! 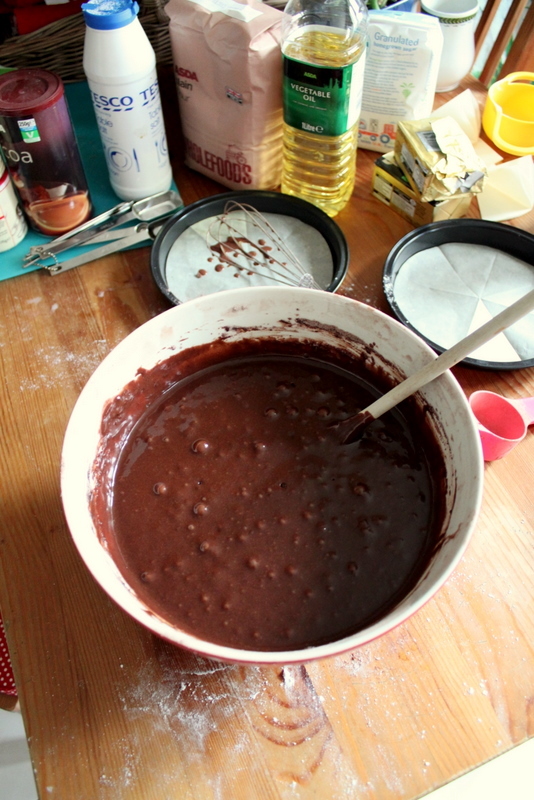 I used a new recipe this time around for the cake batter, but only because I couldn’t find my Mum’s recipe. I know it is in my e-mail somewhere, because she sent it to me in January 2009. Yeah, that’s right, I have a memory, too bad it doesn’t extend to where I put the recipe or the e-mail with the recipe attached to it. I made a few alterations to this new recipe (less sugar, more cocoa) because I prefer my cakes richer and not so chocolate-y sweet. 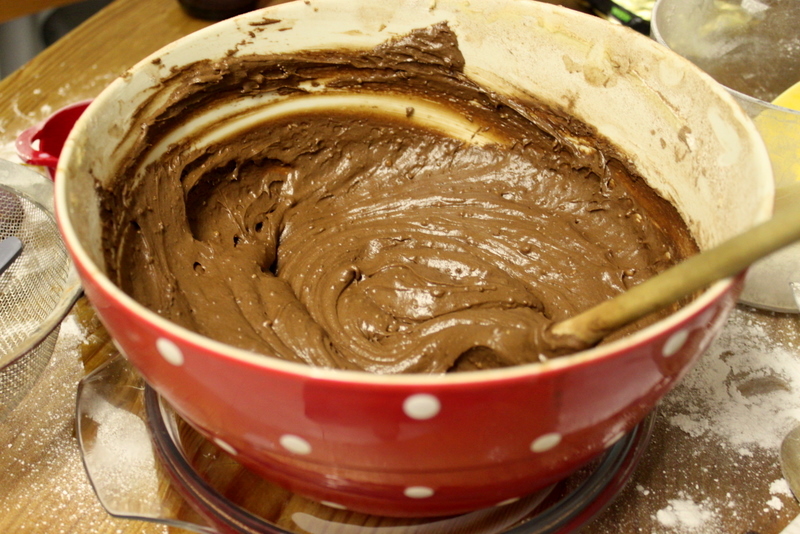 The batter ends up quite liquidy at the end, because you add boiling water to the mixture to keep the cake nice and moist. 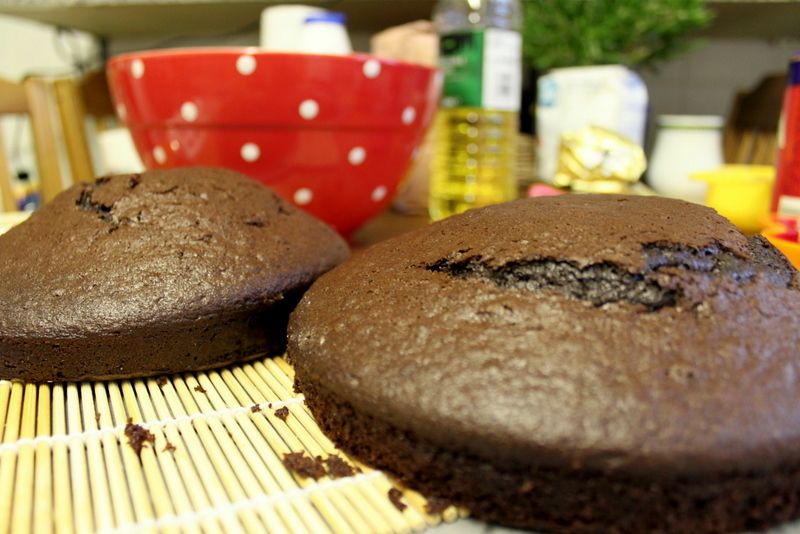 It literally pours into the cake pans! It pours so quickly, because it is so liquidy, that I actually slightly over-filled the cake pans for the first round of baking, but it isn’t really a problem (as you will see later). I figured it was better to deal with slightly bigger than desired cakes than to try and remove liquidy batter from cake pans back into the mixing bowl, which would have ended in disaster. 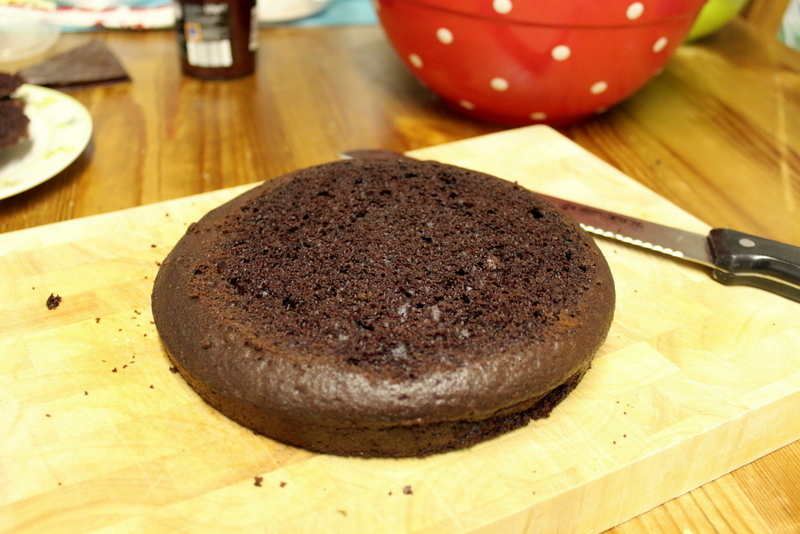 I baked the cake for about 30 minutes on 160°C. Because I was baking two at a time, they ended up a tiny bit wonky as the temperature in our oven isn’t even throughout (but again, not a huge deal). Next, I made the frosting (or icing). 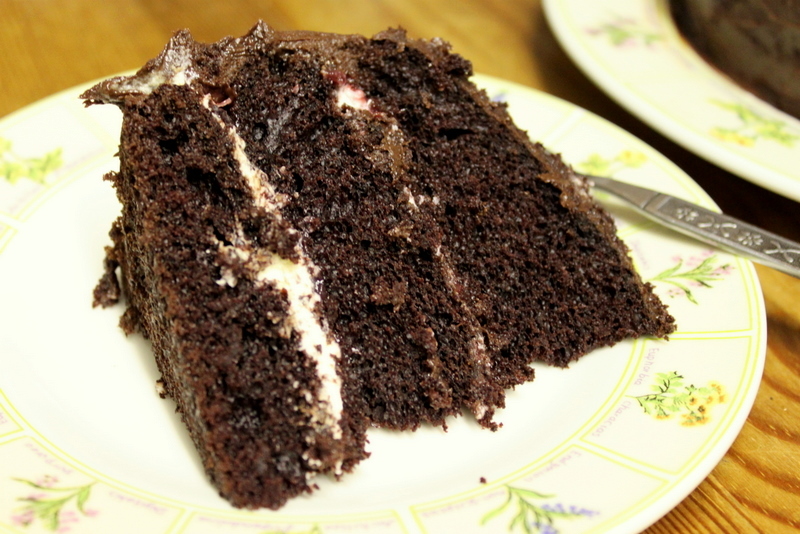 I made a chocolate butter cream, again, slightly changing the recipe to include more cocoa, because originally it just tasted like powdered sugar – more like a royal icing than a buttercream frosting. It is delicious and cocoa-y now though! 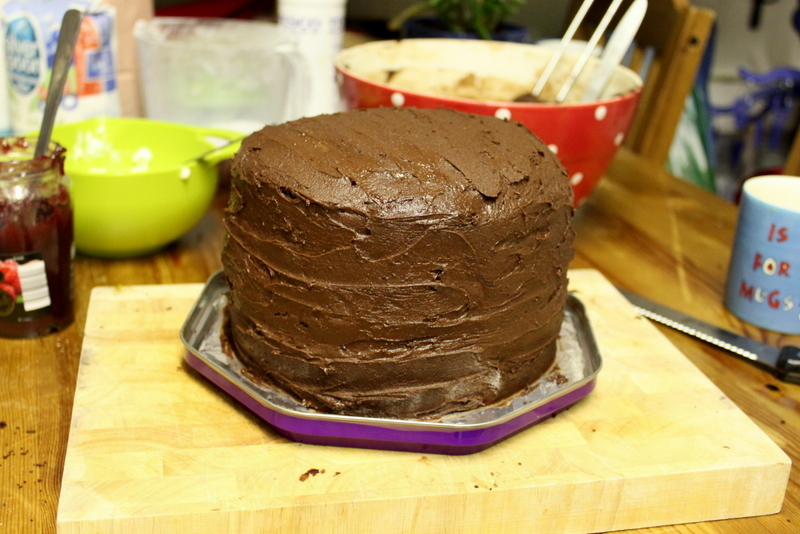 After all of the cake layers (I baked six in total) were cool, it was time to assemble the cake. 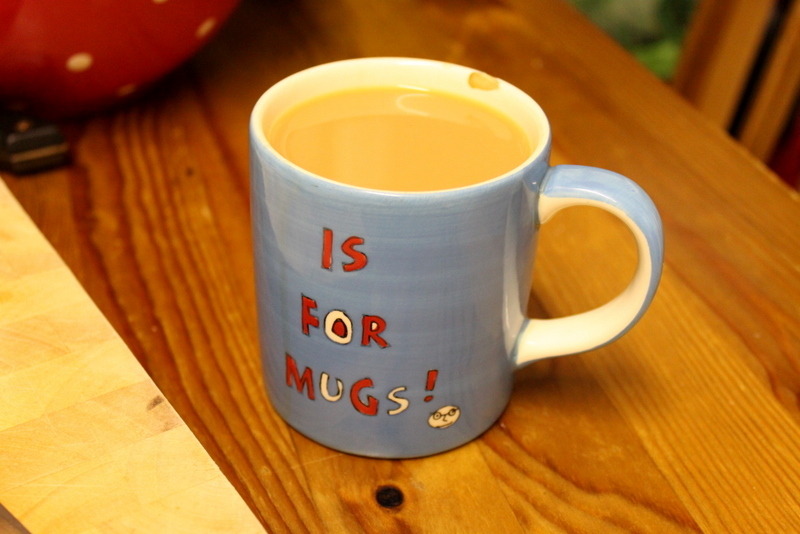 The first and most important step is the cup of tea to keep the star baker going! 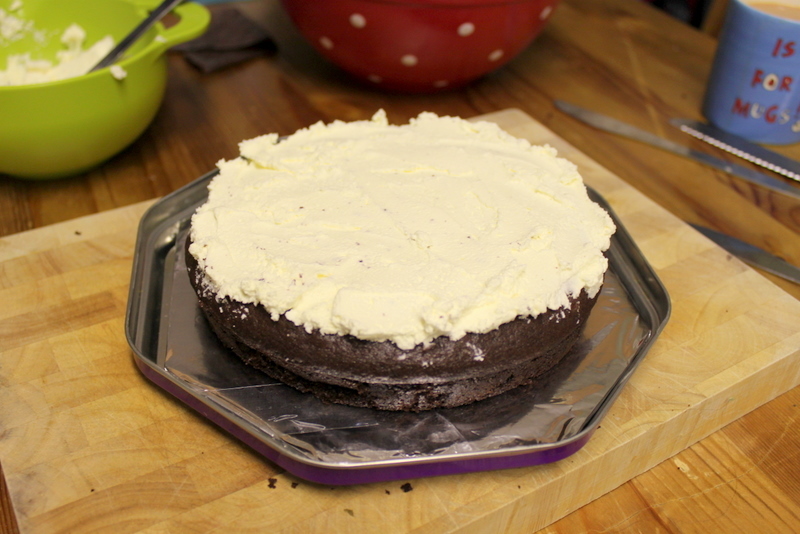 The second step was to remember to take the sheets of greaseproof paper off the bottom of the cake layers. I don’t normally use greaseproof paper for something like this, but because I was having to use the same cake pans multiple times in order to get all the layers done (two pans, six layers, you do the math), it meant I could remove the cake from the pan without it being entirely cool, but not have to worry about the bottom sticking to the pan. 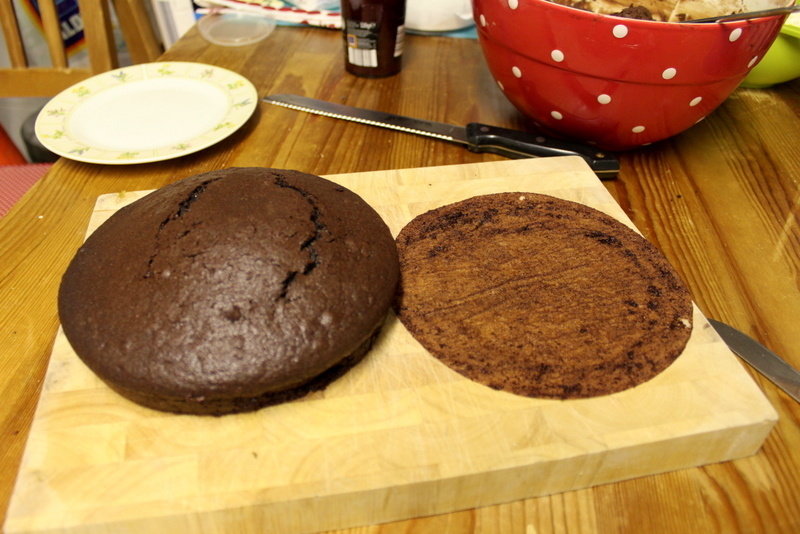 After that, I had to even up the wonky cake layers so that they would sit right for the final product (otherwise the entire cake would end up uneven and fall apart, which is not the best way forward). But like I said earlier, it isn’t a huge deal, because one) it is really easy to do and two) it means you have extra bits of cake that you can eat right away (Ian especially liked this step)! 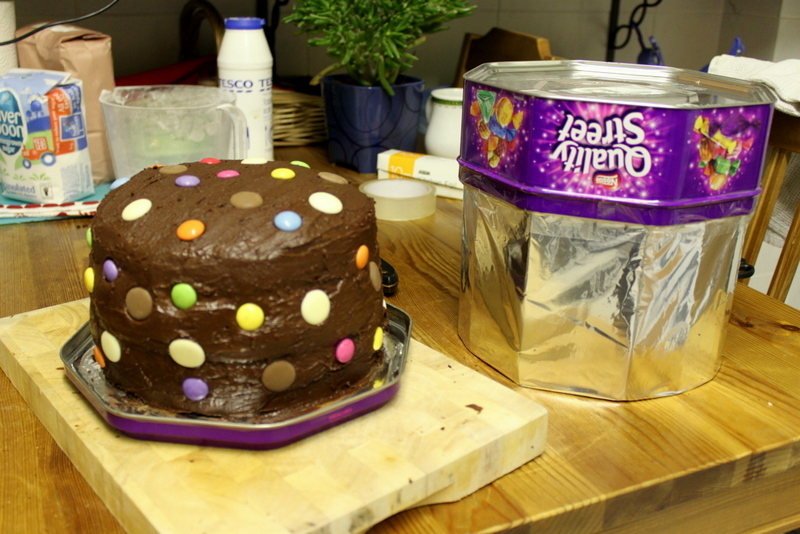 I decided to use a Quality Street tin from last year for putting my cake in – it has the right size base (lid) and it isn’t a massive problem if I don’t get it back – because let’s be fair, we’ll have another fifty million in our house after next month, like every other person in the UK. 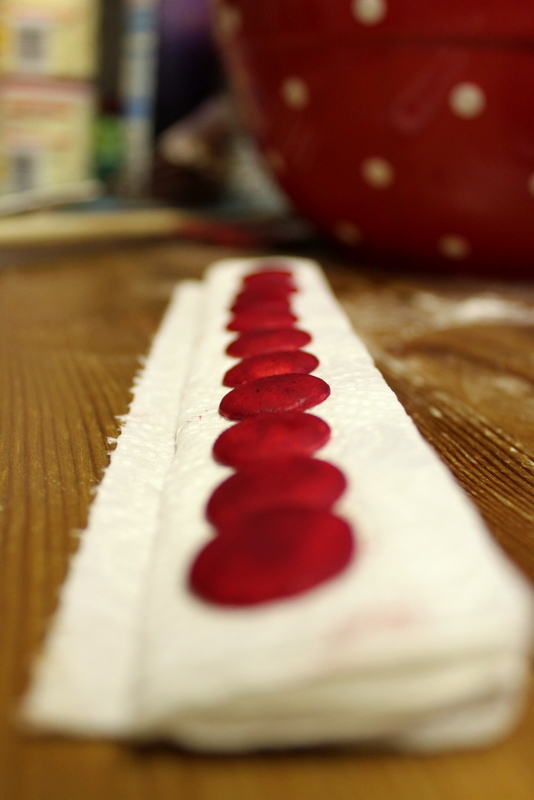 The first layer of filling to add was a layer of cream. I used hand whipped double cream (mostly because I was too lazy to get the food processor out and there was only a little bit of cream to whip), unsweetened! I never add sugar to my cream for dessert, because I find it makes the whole thing overly sweet, which isn’t nice. 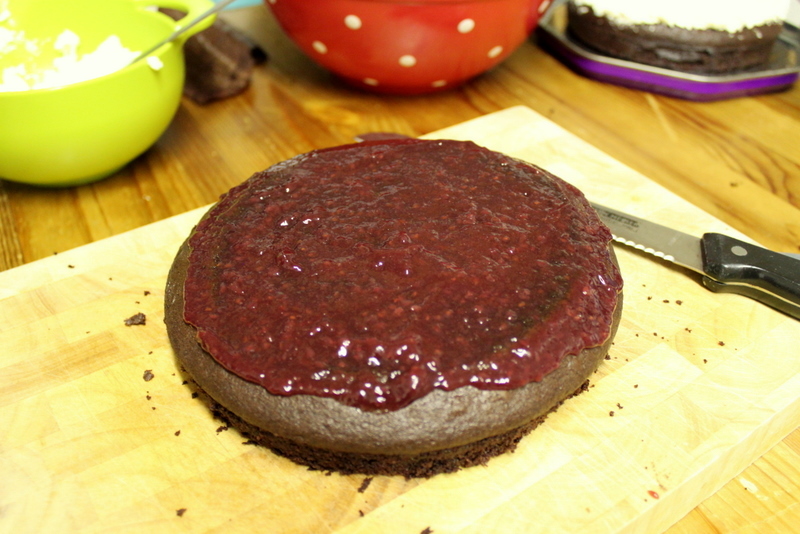 Then, and this bit is important, add the next filling layer of fruit (raspberry conserve in this case – and conserve always, not jam or jelly, because again it is less sweet – the tartness is delicious again the cream and cake) to the bottom of the next cake layer! 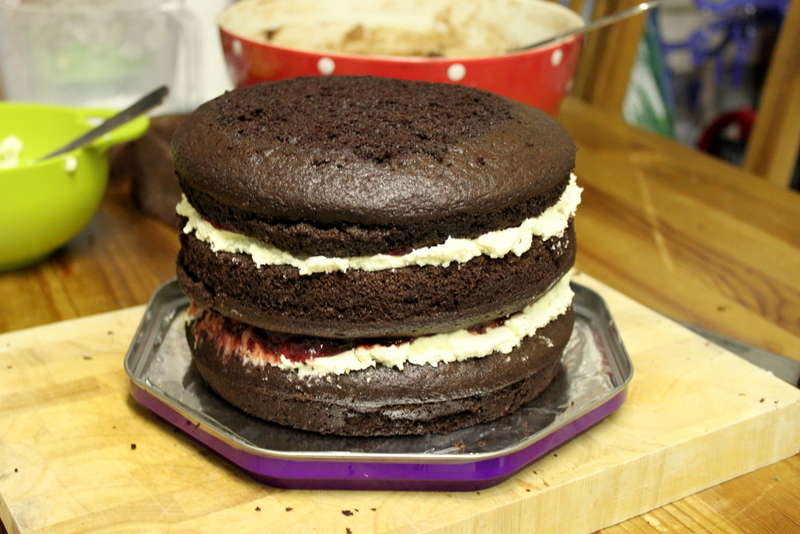 Then you simply stack the cake layer on top of the bottom one and begin the process again! 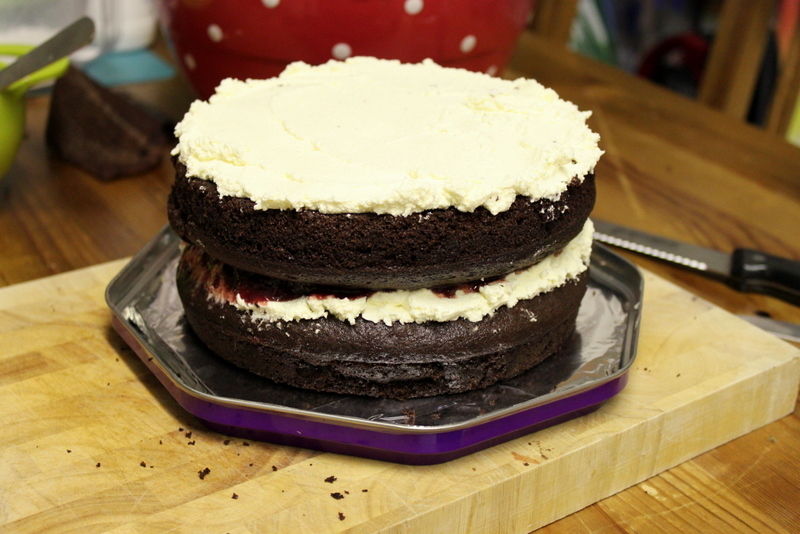 And voila, three cake layers, stacked, with cream and raspberry between both layers! 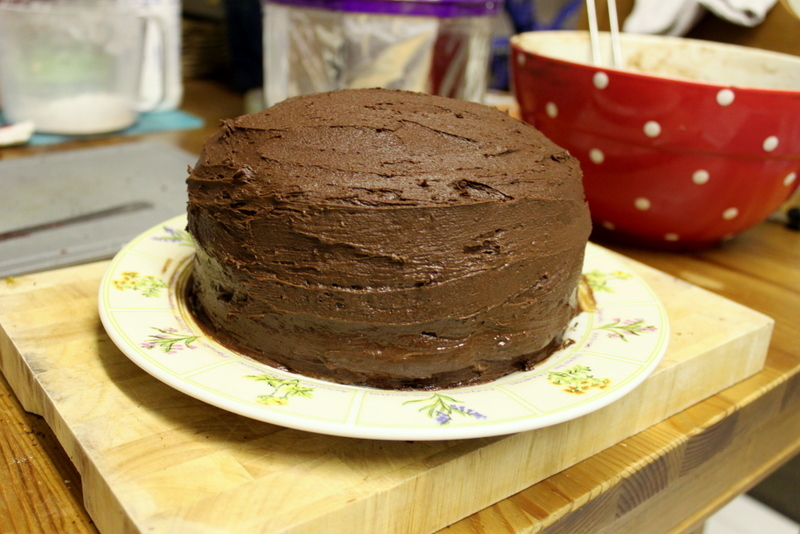 I then used my frosting, which was now a good texture (although it did need mixing once through before using) to make my cake look super professional, by filling in all the gaps and uneven bits with delicious cocoa-y goodness. 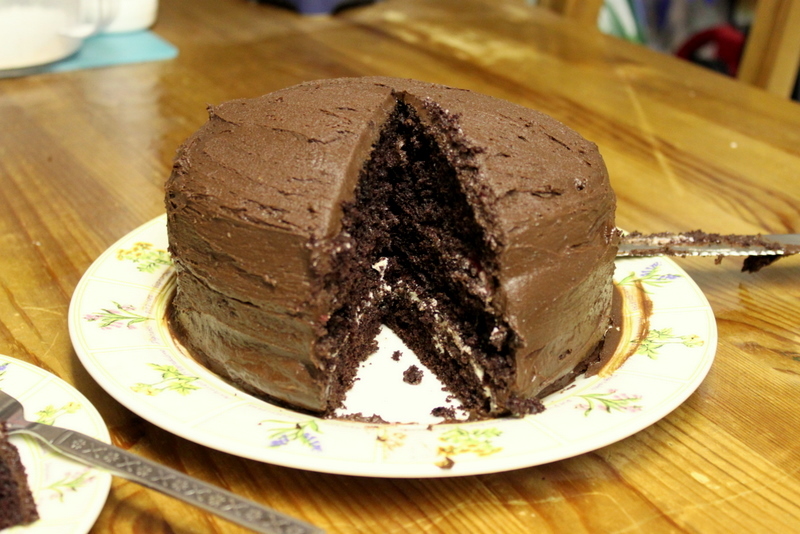 The key is to make sure you put lots of frosting on your knife and apply generously to the cake before trying to spread it – if you are too conservative you’ll just end up tearing the cake and ending up with all those little unattractive bits of cake floating in your frosting. I mean, it’ll still taste awesome, but it’ll look messy. Well… more messy. 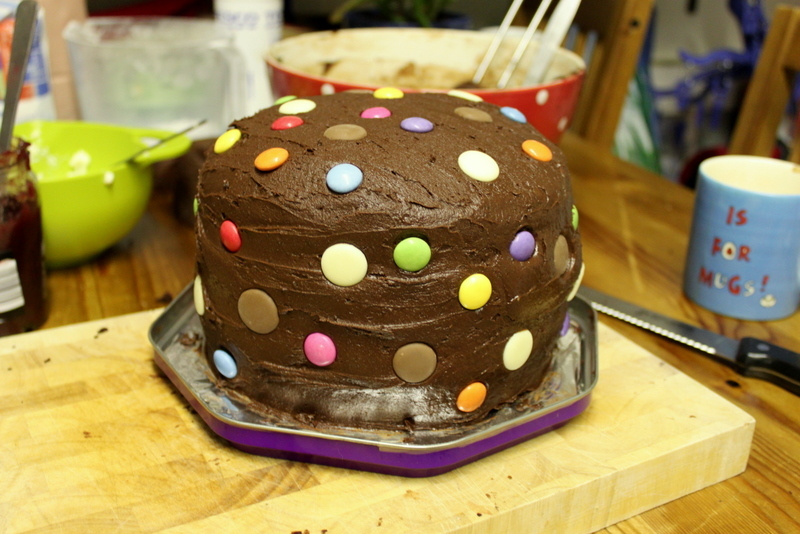 Then, because it was for Children in Need I added some polka dot decorations! 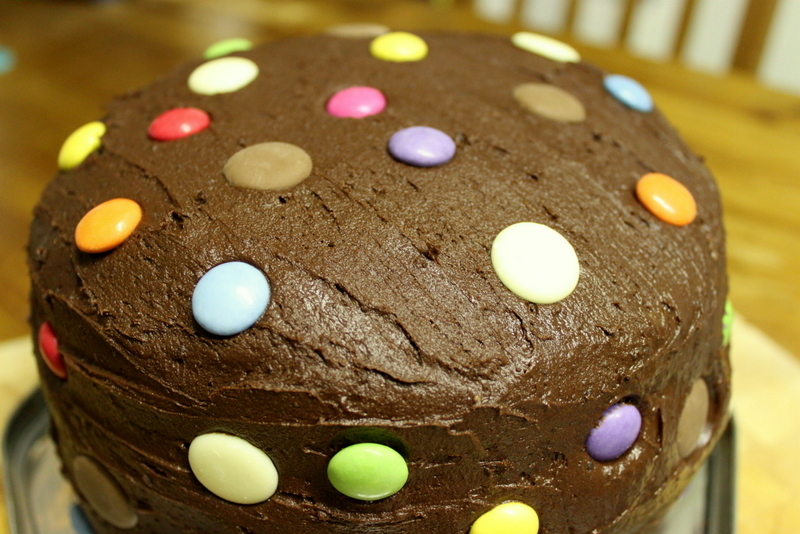 I used Chocolate Buttons, Milky Buttons, and Smarties. I am sure they will all have fallen off by tomorrow morning, but it’s the thought that counts. Again, if you aren’t from the UK… Pudsey (the bear mascot for Children in Need) loves polka dots! Look! With a clean table behind it, it looks like of pretty. Or maybe cute. Yeah, it’s a cute cake. How pro is that finish people? Just look at it! But not too close. Let’s keep up the illusion that I am a master baker. 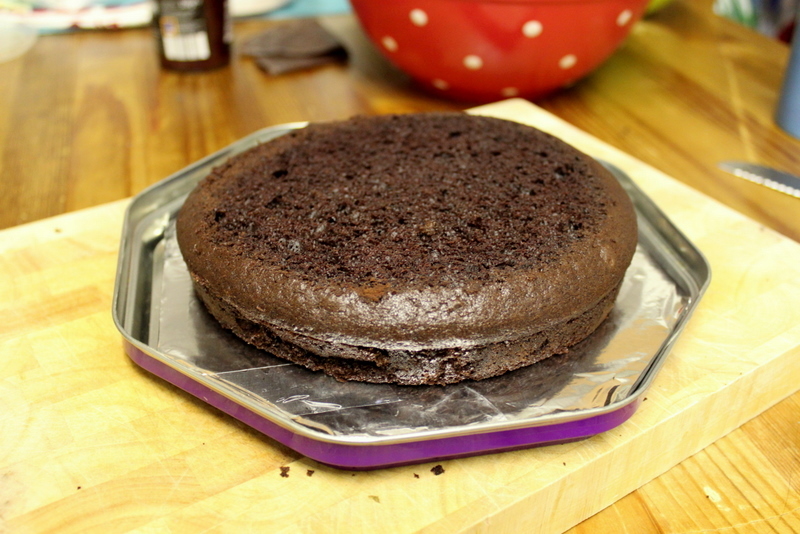 Now, I did come across a tiny problem, which was since I made a massive three layer cake, the Quality Street tin lid (base) was now way too small to consider using it to contain the cake… on its own. 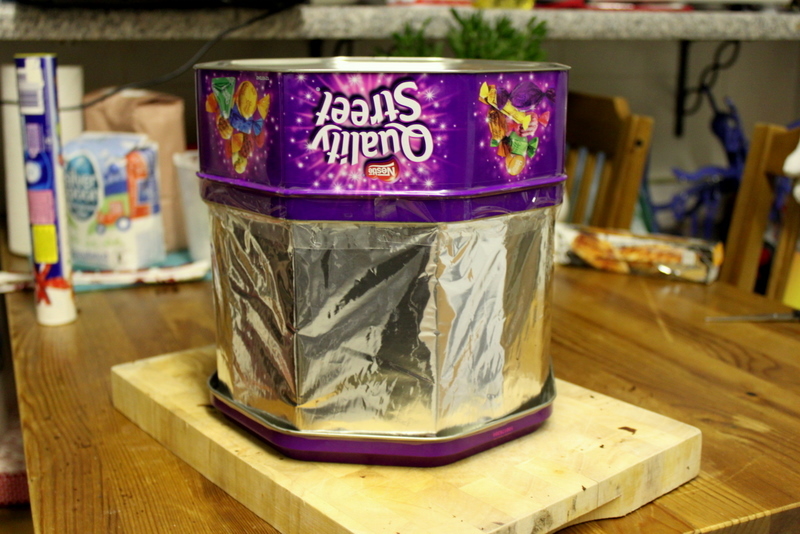 I improvised with some cardboard and made it foodgrade by covering it with aluminium foil and then fixing it to the Quality Street tin! It’s a perfect fit! Just don’t be surprised if the edges of the cake are a little smooshed when it comes off at the bake sale table tomorrow. And you know, don’t let anything hit the side, because it’ll collapse and crush the cake. Also, when you carry the cake, be sure to hold it even from the bottom, otherwise the cake will tip over and because the lid isn’t fixed to the base, the whole thing will fall off. But you know, other than that… it’s perfect! 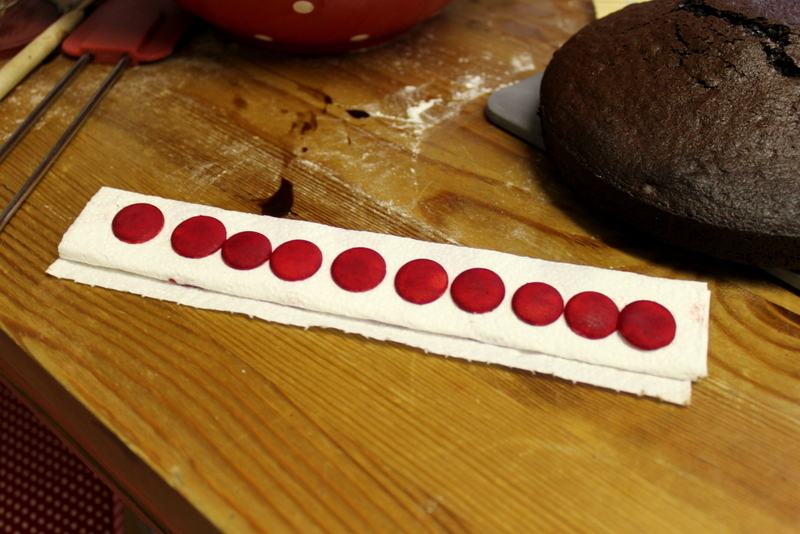 Now, if you’ve been paying attention, you will have remember previously I said that I made six cake layers. But I’ve only used three so far, for the Pudsey cake! So what did I do with the other three? Well, once people learn that you are making a cake, they want some. But if it is for a charity bake sale I can’t really send it off to Ian’s work with a few pieces missing. 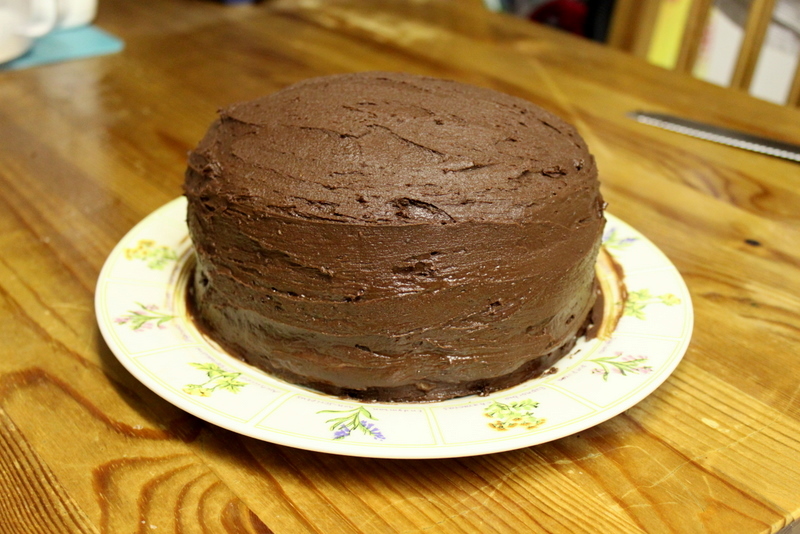 Therefore, I made another (smaller) version of the same cake (minus the decorations). Voila! This one also looks pretty good. 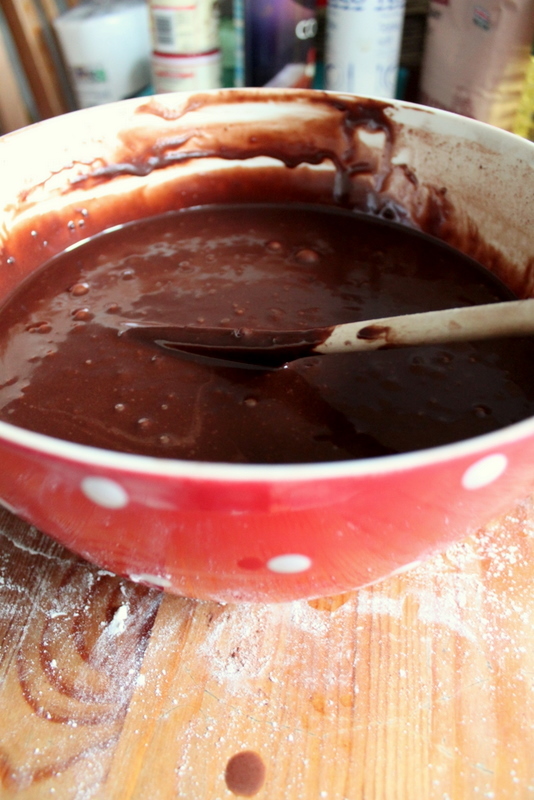 I think maybe I should have made this one first, in order to practice before making the Pudsey cake. 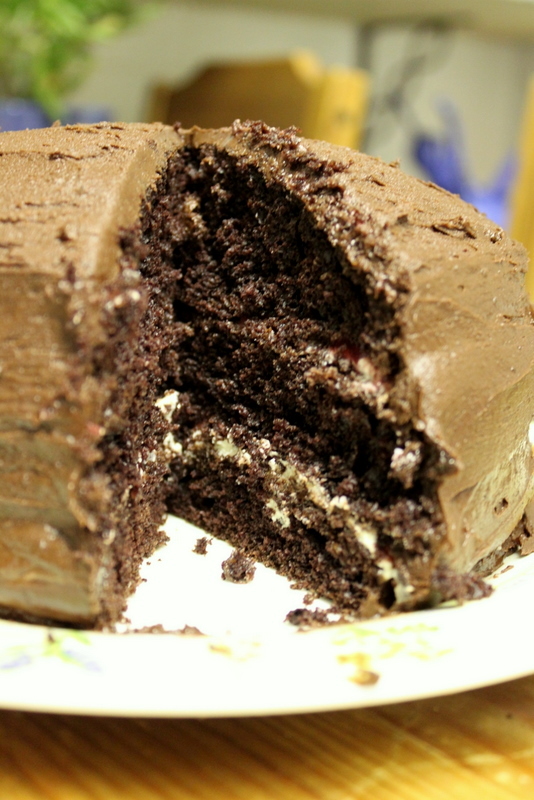 But this one was also easier because the cake layers were smaller. However, it is less cute. Despite it being low on the cute scale though, it was pretty high on the delicious scale. I had a normal sized piece, to test it out. Ian only had a little piece because he was already pretty full from all the extra bits of cake I gave him earlier! The first piece is always a little messy when it is served, but this one didn’t come out too bad, if I do say so myself. By tomorrow, all of the layers will have settled a bit more, which will help too. 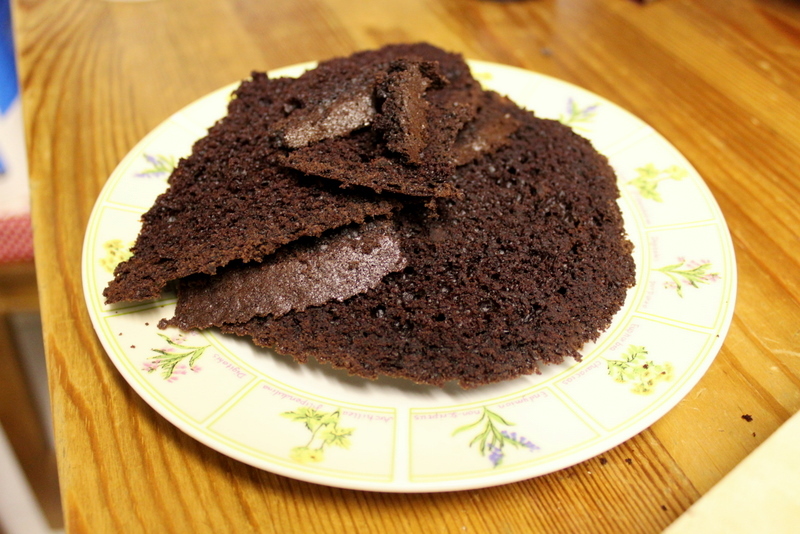 However, the cake itself came out so light and fluffy and moist. I will definitely use that (modified) cake recipe again! This last picture is my pro shot, like if I had a cafe, I would put this picture in the window to entice you all in through the doors to buy my cake at an extortionate price. How much would you be willing to pay? 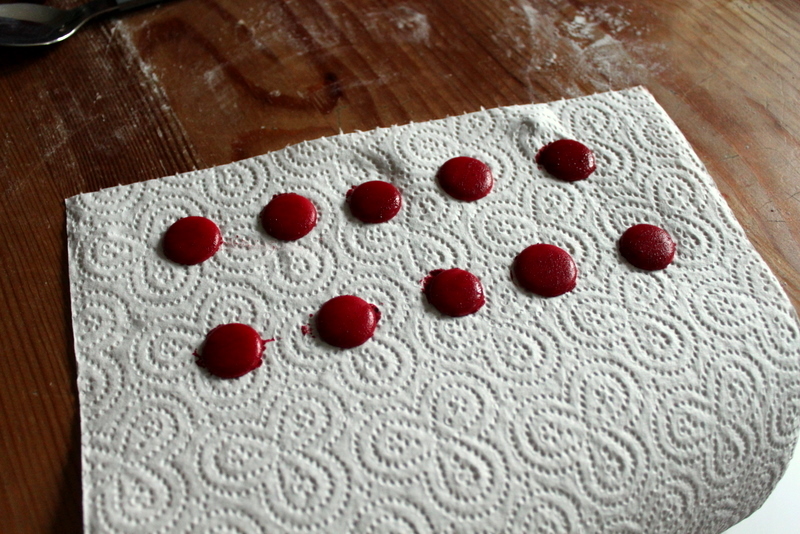 Then I blotted them off and it had kind of worked, but they were still white in places, so I repeated the process and it worked pretty well after that! Once they dried out, the colour came up pretty good. But I tasted one and because of the amount of food colouring I had to use to get the colour to ‘stick’ they ended up tasting pretty bitter, so I decided not to use them. 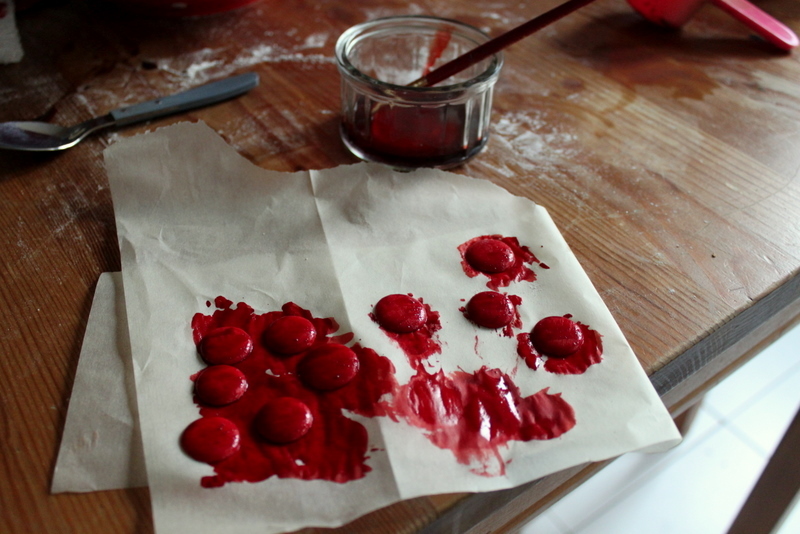 But, if you ever need some edible chocolate (if not entirely tasty) polka dot decorations in colours other than brown and white and for whatever reason you cannot get Smarties, then it totally works (with some patience). Yummy yummy, can’t wait to try it later. Ian’s team have all eaten a slice of your Pudsey Cake and we can officially say it was gorgeous!! Thank you sooooooo much! This is Anna (organiser of the Children In Need Bake Sale at AMEC). Your cake went down a storm- it looked amazing! Really really appreciate you taking the time to make it. Up to this point, we have made over £200 from donations….and still counting! That is great! I am glad the cake went down well. Ian sent me some pictures of the other goodies that were available – I am hoping at least one of them comes home to me. 🙂 I am glad that I could help out. Let me know how much you raise in total!